So, we were sittin’ here one night last week, and a car pulled up in the driveway. Now, you know this isn’t a normal occurrence for us. We’re loners. So, hubby answered the door, and ushered the man in, cuz it was cold out there. It was our neighbor a couple houses down, whom we’ve never met, giving us an invitation. Another invitation? Oh, I didn’t blog about that other one yet did I? Geez, I’m no good at keeping up with this blog. OK, let me back up…. Let’s see….. a few weeks ago someone pulled up. Hubby answered the door (as I am really shy, and don’t like strangers). Leanne & someone, I cannot remember her name, gave him an invitation for Sam & I, as we were new to the neighborhood. The invitation was to a “Ladies Christmas Tea” at the Baptist church, with an ornament exchange. Now me, that’s not my gig. It was real nice of them to invite us, but me….church….ladies tea. Yeah, not happenin’. So, anyway, that was our first invite in the new neighborhood. 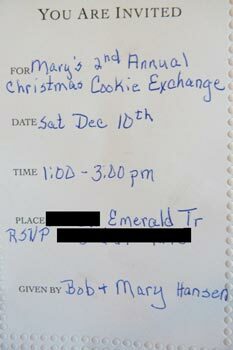 The invitation we received was to a Cookie Exchange. Now that is right up my alley. Cookies. Christmas. 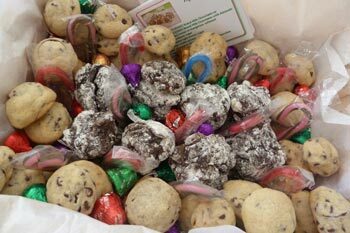 I make hundreds of cookies every year & give them away in baskets as gifts. Cookie exchange. I can do that. Well, except for the whole not knowing anyone. But, I steeled myself to try! I was new here, I wanted to know my neighbors. I wanted to go. But, oh no, it was this Saturday, the 10th. Ack. Five days, no car to get ingredients, and I don’t even have a favorite or special cookie I always make. Well, not really. Oh, and I just realized that hubby had drill so I had the kids alone this weekend! Bah! Well, I was determined to go. Why? I don’t know. I guess because we are in this new neighborhood, and everyone seems sooooooo nice. I just wanted to be friendly & know my neighbors for once. Since I have no phone, I had hubby call them one day at work & ask if kids were gonna be there (thanks to my faceboook friend for the idea of calling). Yep. Kids OK. So, that was settled. Now, to decide what cookie to make with the ingredients I had. Going through my cookie list this year, I decided on my Hershey’s Kiss cookies. I’ve been making this recipe for years. It’s never failed me. You can find the recipe here. The recipe has no eggs, which means you can eat the dough straight from the bowl….oh, yummy! As I was about to make my tray, I kind of freaked out. 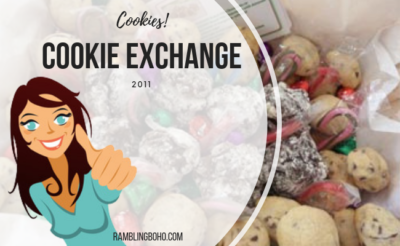 OK, not really, but I had to ask my facebook peeps how many cookies was I supposed to bring to a cookie exchange? I had no idea! The consensus was 6 dozen of one kind. Well, since I didn’t know how big or small this party was going to be, I decided on 6 dozen (I had made 9) of my Hershey Kiss cookies, and two (I made 6) of my cappuccino ones, just to be safe. It wouldn’t have been too little, and if it was too much, that would be alright I’m sure. So, Saturday, Sam & I went on our merry way to the neighbors two houses down. The boy stayed home and played video games. He would not want to go. He’s more socially awkward & shyer than I am. Don’t know how possible that is, but it’s true. Now, mind you, that’s about a half mile walk, but we got there without getting too cold. Oh my, the spread she had laid out! She had breads, meats, cheeses, crackers, veggies, punches, and cookies galore! She’s like me! Bake, bake, and bake! After a few minutes, a few more people showed up. Let’s see if I can remember who all was there…..Bill & Margie just down the road, a woman named Toni and her husband, a woman named Carolynn and her other half, and two others whom I cannot remember their names. As we were leaving Leanne and her 7yr old son from across the road stopped by also. Everyone brought lovely cookies. Yum, yum. Everyone remembered Sam from the Halloween party at the firehouse. I didn’t go to that…was feeling angry that day, and not well. I felt out of place a bit as all these people have known each other for years, but they were very nice, and included me in conversations, and such. It was nice. Sam was a bit bored as there were no other kids, but she had six dogs to pet & coo over. That made her happy. Oh, and I won a ‘door prize’ for finding the identical ornament on two different trees. Hehe. Too bad I looked like a fool not knowing how to spell squirrel correctly. Life has no spell check. But it is a real neat ceramic martini glass shaped candy/nut holder. And some homemade hot cocoa mix. As we left, everyone gathered their loot. 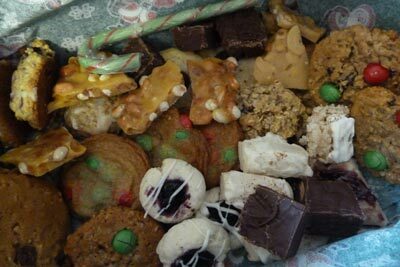 All kinds of different cookies. Peanut butter snowmen, cranberry rice crispy treats, thumbprint in blackberry & strawberry, nutmeg logs, shortbread, a couple different oatmeal ones, M&M, and sugar cookies. Well, shoot. I just remembered I didn’t grab any off the sugar cookie plate! There was also two types of fudge & two types of brittle. I really didn’t take much home. Two of each…except for the sugar cookies I forgot. I wonder if I’ll save any for my family? It was nice to meet more of my neighbors. I actually wished there were more people to meet there. How odd is that?